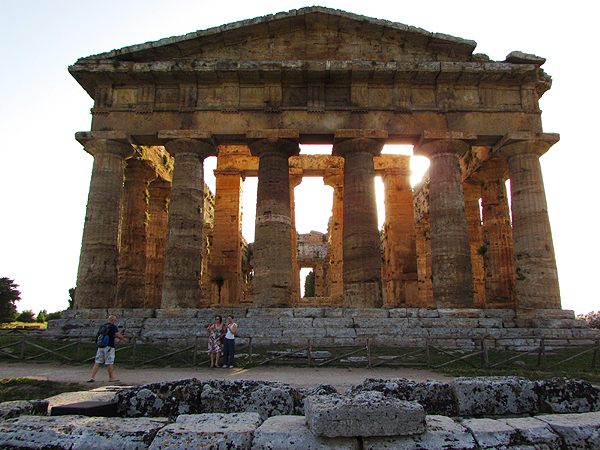 The traces of the ancient past are present everywhere in Paestum: The famous ancient Greek temples today still bear testimony of the historical importance of the town, Odysseus during his wanderings also passed Paestum. Its fascinating past, the location by the sea and the Mediterranean climate moved wealthy Europeans to build up their refuge here. 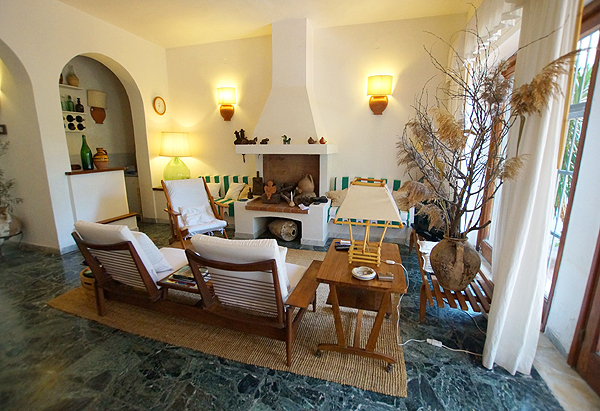 Also the family owning Casa Leonardo appreciates its spacious holiday home, to escape the bustle of daily life and let the soul relax. Casa Leonardo offers best conditions for a soothing holiday: located in a cul-de-sac of the well-tended villa subdivision of Laura di Paestum, you reach the sea and the long, wide and softly falling sandy beach of Paestum within only ca. 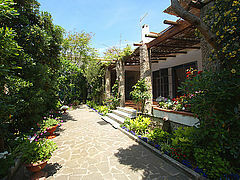 80 m.
Two beautiful, large terraces invite you to a “life outdoors”. 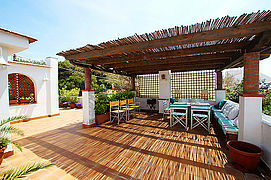 The spacious roof terrace with sea view located on the upper storey is a paradise for sun lovers. But also guests preferring the shade can easily spend time here: Below the pergola, you find a large table with chairs – ideal to sit together in the evenings. On the roofed terrace of the ground floor, which cannot be looked upon, you have the feeling of staying in a green oasis: the diverse flora of the small garden, a comfortable dining corner and an outdoor shower communicate “pure holiday sensation”. The interior of the house is no less remarkable than the exteriour of Casa Leonardo, concerning both comfort and style. In the spacious living/dining room with its beautiful round arcs you will immediately feel at home: two stone sofa benches with colourful cushions, a satellite TV (with English channels) and a radio provide for entertainment, cosy armchairs and a dining table of massive wood with matching chairs create a homely atmosphere. 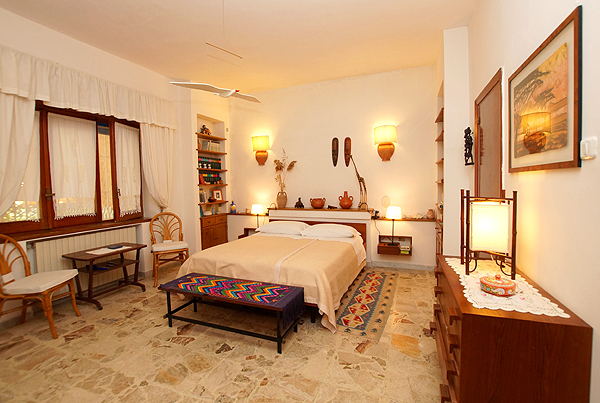 The interior reflects the interests of the owners: tasteful travel souvenirs from all over the world and many books lend a personal note to the rooms. 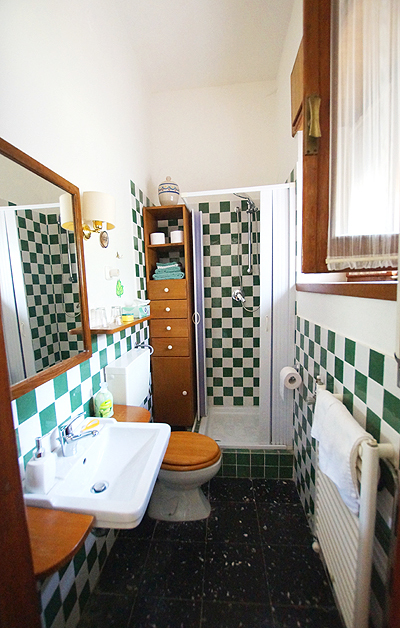 Your holiday home offers three bedrooms, which are all equipped with their own respective bathrooms (shower or bath tub/bidet/WC): all together, seven people can stay in one double bedroom (with safe), a twin bedroom and a three bedroom. The kitchen of Casa Leonardo is fully equipped (incl. microwave, oven, dishwasher). Due to the integrated central heating system, the holiday home can also be recommended for a stay in the low season. 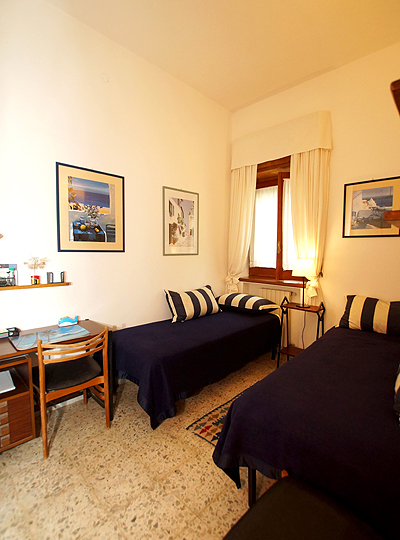 As guests, you may use the washing machine, iron and iron board. 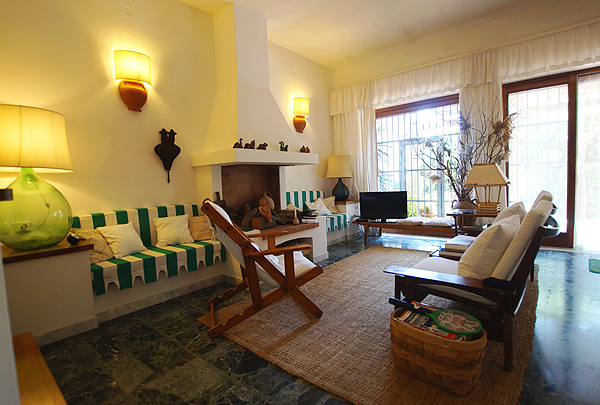 There is also wifi available at Casa Leonardo. You may park your car on the fenced property. The nearest stores and restaurants are found within about 800 m.
Discover during your holiday in Casa Leonardo the diversity of the Cilento! 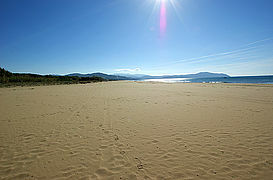 Water rats will find beautiful beaches and clear water along the coast. Lovers of long hiking tours will get their money’s worth in the national park. For culturally interested guests, apart from a visit to the temples already mentioned, excursions to Pompeii, Herculaneum, Velia or Padula are just a few more possibilities. Please note: As Casa Leonardo is equipped with partly fragile, partly very personal objects, the owner does not consider it suitable for families with children under three years of age. If necessary, e.g. 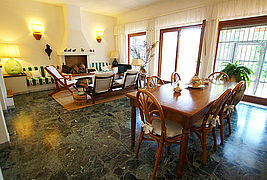 in case of late arrival of the guests, the obliging and discreet owner reserves to use the villa's dependance. 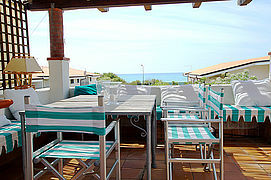 From the sun terrace you enjoy a wonderful sea view. 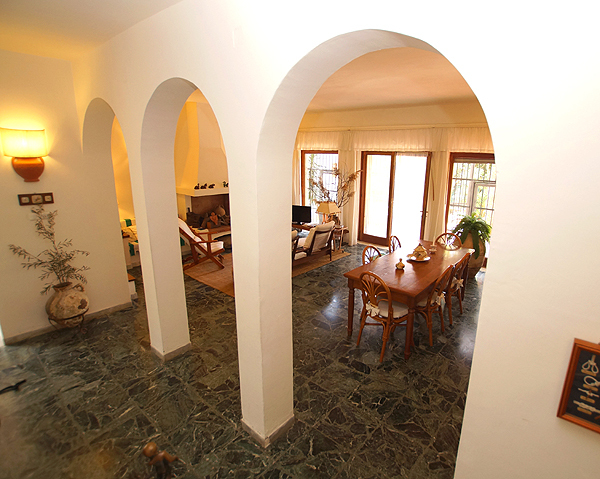 Beautiful round arcs decorate the ample living/dining room. 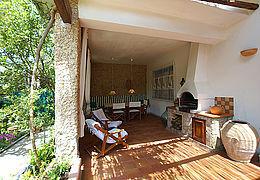 The dining corner with barbecue on the cozy terrace on the ground floor. 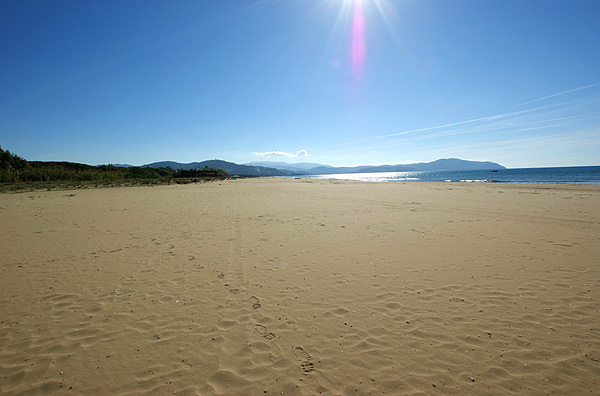 The long, wide and softly falling sandy beach of Paestum. 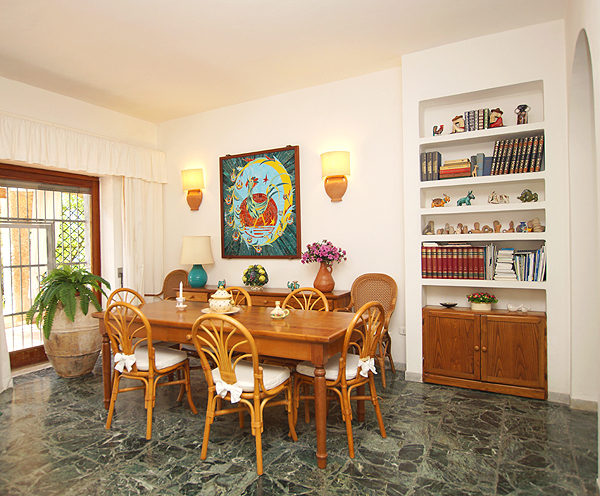 A lot of space for dining together: The dining area of Casa Leonardo. Also the living area is furnished tastefully. Internally as well as externally the villa is a real gem (here the large roof terrace). 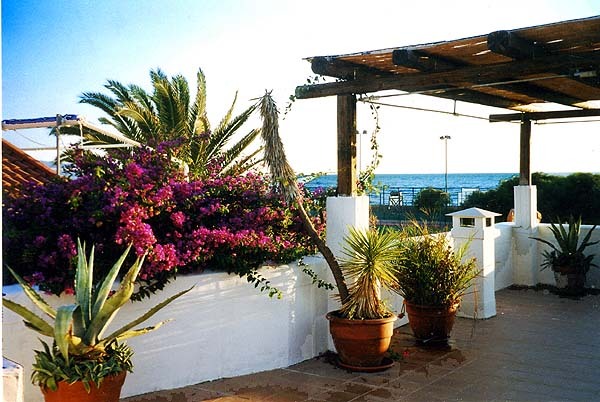 Mediterranean atmosfere in the outdoor area of the holiday home. 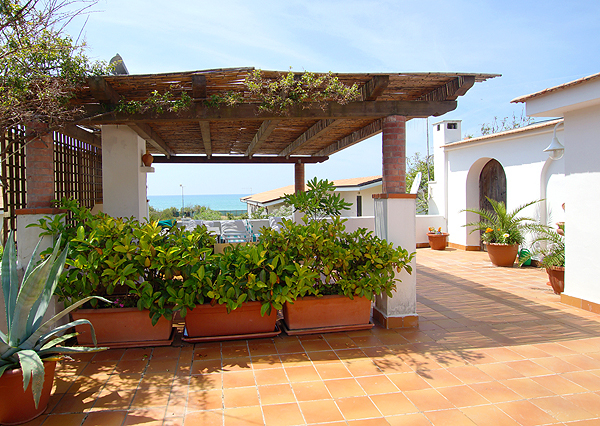 From the spacious roof terrace you've got a great view onto the sea. 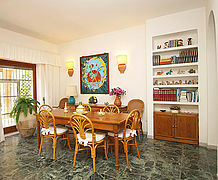 From the living/ dining room of Casa Leonardo you have access to the terrace. Glance into the bedroom with three single beds. 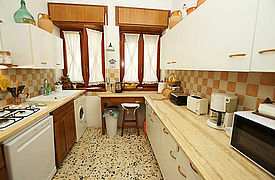 The kitchen of Casa Leonardo is well equipped. 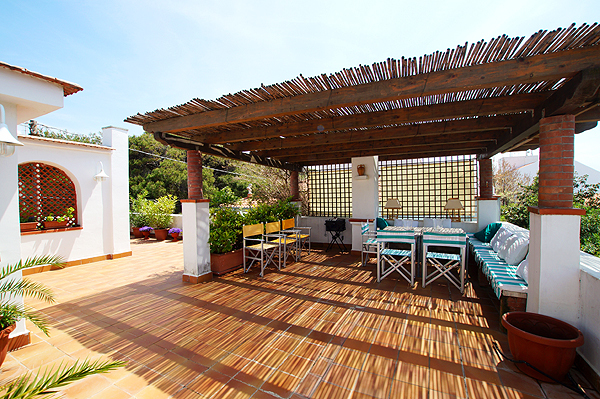 Perfect place for sunbathers: the roof terrace. Altogether there are three bathrooms at the holiday home. ... and into the third bathroom. Paestum – an ideal holiday destination for those loving ancient culture. The impressive temples are within reach. Wir sind immer wieder begeistert von der einzigartigen Landschaft. Außerdem findet man hier noch das ursprüngliche Italien vor. Was uns an der Casa Leonardo besonders gut gefallen hat, waren die traumhafte Dachterrasse und dass alles sehr großzügig ist. Unser kulinarischer Geheim-Tipp: Mozzarella ist besonders gut in der Region. Alles in allem: Empfehlenswert! Hier ist einfach alles möglich: Baden, Kultur und Stadtbesichtigungen. Die Lage der Casa Leonardo in Strandnähe ist perfekt. 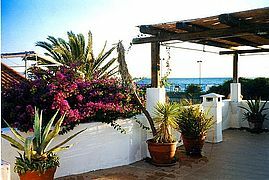 Weitere Highlights der Unterkunft sind die Dachterrasse mit Meerblick, die tolle Einrichtung und Ausstattung sowie die sehr nette und ruhige Vermieterin. Was wir für einen Ausflug sehr empfehlen können, ist eine Zugfahrt nach Neapel mit Stadtbesichtigung. 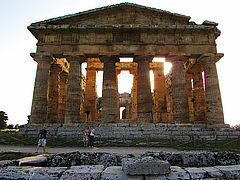 Wir kommen auf jeden Fall nochmal hierher, weil der Urlaub in der Gegend um Paestum wirklich sehr abwechslungsreich gestaltet werden kann! Ob Anreise, Urlaubsregion, Ort, Ferienhaus oder Umgebung – für uns war der gesamte Urlaub ganz einfach perfekt. Zunächst liegt Paestum sehr zentral, zwischen Salerno und dem Cilento. Dann ist die Lage des Hauses in Strandnähe ebenfalls optimal. Besonders toll fanden wir die dortige Ruhe und die nette Art der Vermieterin. Unser Geheim-Tipp: In unmittelbarer Nähe der Unterkunft kann man im Hotel Schuhmann wunderbar einen Sonnenuntergangsdrink an der Strandbar einnehmen. Weitere Pluspunkt: Zu unserer Reisezeit - bzw. eigentlich schon ab September – war es angenehm ruhig und überhaupt nicht überfüllt. Die Ruinen von Paestum konnten wir in aller Ruhe besichtigen. Was bleibt uns anderes übrig… wir müssen wiederkommen! Wir hatten eine tolle Zeit in der Casa Leonardo. Das Ferienhaus war super ausgestattet, riesig und befindet sich in einer tollen Lage! Alles war bestens! 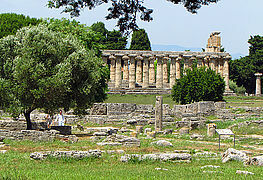 Auch die Umgebung hat uns begeistert, vor allem die Ruinen von Paestum, das herrliche Meer und die Nähe zu Neapel. Was wir sehr empfehlen können, ist der Agriturismo Sirena - einfach fantastisches Essen!! Unsere Tipps für Ausflüge: Vesuv, Amalfi und die Villa di Poppea. Wir lieben Süditalien!! Natürlich kommen wir wieder! Prices per week are valid fort he number of persons given in brackets and incl. bed linens, towels and cleaning. In addition to the final cleaning, the house will be cleaned once every week. * During the periods 06.10.18 - 25.05.19 and 05.10.19 - 04.01.20 an additional amount of 55 Euro per week will be charged for a 5th, 6th and 7th person each. 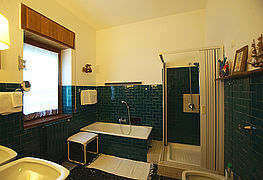 - Heating (central heating) will be charged on the spot according to use. 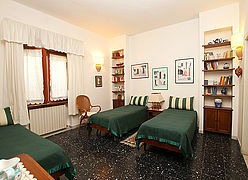 - Day of arrival and departure: Saturday (another day of arrival/ departure is possibile only upon request). - Check-in times: 16:00 h to 19:00 h. Please advise us in case of different arrival times. 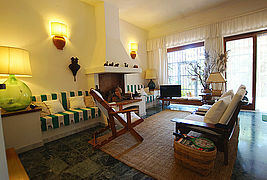 - The fireside is a decorative element only.